one40william is one of Perth's most significant and influential projects, setting a benchmark in environmentally sustainable design and bringing new life to the city's retail centre. The project revitalises a landmark CBD site, integrating 41,650 square metres of commercial office space and 4,550 square metres of retail, food and entertainment tenancies. Located directly above Perth underground railway station, the site context is unusual in that it includes historic building fabric, major street frontages and a pedestrian mall. The design celebrates heritage, promotes new linkages between workplace, retail and public transportation and creates a positive shared civic space. A thorough investigation of the site resulted in a built form that is confidently modern while responding to the surrounding buildings in scale, proportion and streetscape. Based on progressive responses to workplace design, public realm, climate and existing conditions, the building has been designed from the inside out and strives to engage people who work within, visit and simply pass by. Both celebrating and mitigating Perth's specific microclimate, the building takes best advantage of light and shade. Its orientation allows maximum daylight penetration into the work environment and incorporates extensive landscaped rooftop spaces and winter gardens. The iconic building sets new standards for tenant comfort and corporate social responsibility. 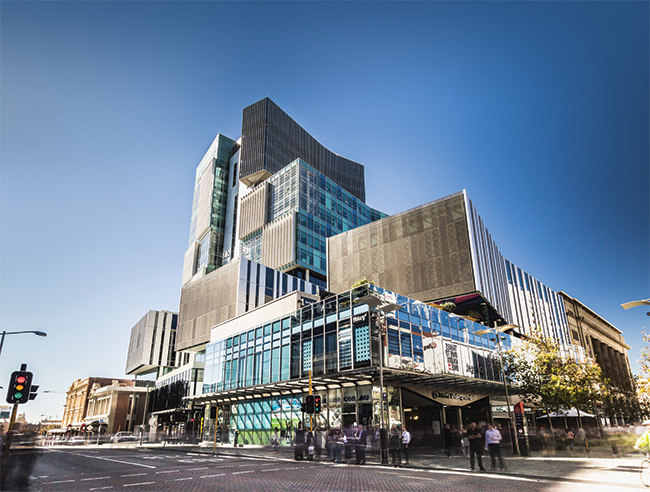 It is the largest building in Western Australia to gain a 5 Star Green Star Office Design as well as a 5 Star Green Star Office As Built rating.